Mick Mulvaney, Donald Trump’s acting chief of staff, was on CNN on Jan. 6 and he was interviewed by John Tapper about the current situation in Washington and about Congresswoman Rashida Tlaib’s profanity-filled statements against the president before calling for his impeachment. 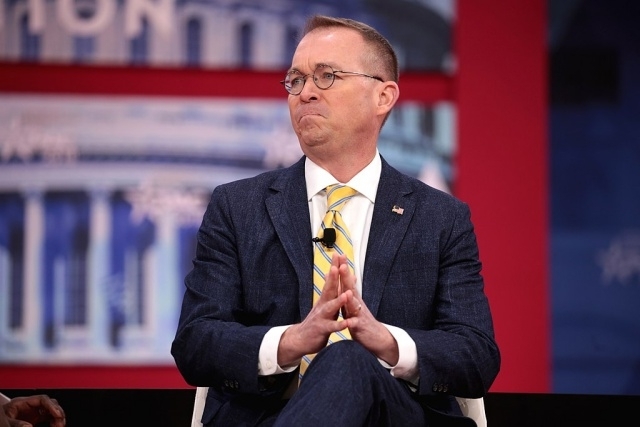 At one point during the talk, the host laughed at Mulvaney’s answer and here’s why. According to CNN, when Jake Tapper discussed about Rashida Tlaib swearing at Donald Trump when she called for his impeachment. He asked Mick Mulvaney if he thinks that the president actually caused the congresswoman to use such profanities in her speech and he replied by saying that no one blamed the president for it. As can be seen in the video, this reply elicited laughter from Jake Tapper. Apparently, the CNN host can’t believe that Mick Mulvaney just gave him this reply. In any case, the chief of staff just went on to defend President Donald Trump until the end. Meanwhile, the conflict in Washington is not yet over and there were increasing calls for the POTUS to be impeached. Just recently, the president walked out from a meeting with the congressional leaders after Speaker Nancy Pelosi revealed that she will not fund a Mexico border wall even if Donald Trump agreed to reopen the government.